We have already started pushing the 140 build to US models. This started about a week ago. OTA rollouts can last a couple of weeks. So keep checking for updates periodically. My US model doesnt have 140 build yet either, I've seen some who have gotten it. Thank you, Chris, I appreciate the update! Not going to rip Honor to bad but the 7x is awful.... The US version does NOT have any of the functions that the european or the asian versions have. Its not a true dual camera.. The US version does not get any updates. Current build for US is B138 which is what mine is on... all other version currently on B192. When support was contacted I was told huh let me investigate, still waiting for answer - 6 days since request. B192 gets ar lens and facial recognition.... again like my Honor 8 - promises promises promises but no delivery... last Honor product I purchase. Last time i called Honor's support it was so scripted and their fix for everything is to hard reset and even had the balls to ask if i had cleaned the lens for the camera due to the grainy low light pictures... They also cotradicted themselves.... I was told they do not have any updates for either models... They already have B192 which has the facial recognition / AR Lens Asia / European models. B140 which only has AR Lens update and is only for US models. I was told that US might not get further patches asked why and I got no response. I'm in the US and I got my 140 update over a week ago. 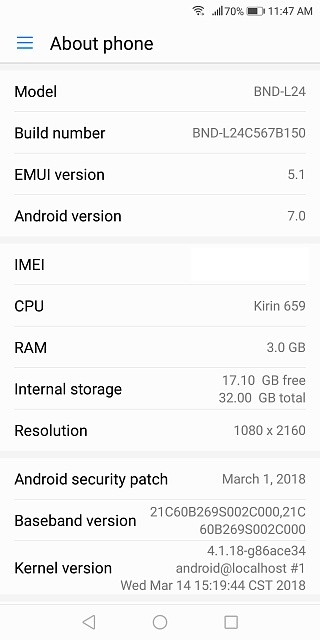 It has the Feb 2018 security patch. I can't complain about my X7 not being supported. So, tomorrow is the beginning of the US model OTA Oreo rollout that nobody's talking about. I've been using my Moto G5S Plus lately but may move the SIM card back to the Honor 7X to see how long it takes for the update to hit my phone. It's D-Day, and the update has yet to hit mine but it's not even 6:00am local time yet. I received the last security update about 2 weeks after I saw it reported here, so it could take a little while before we see this OS update. I was reading comments on various sites late last night about the OTA rollout and saw a couple that said their device was already updating via OTA. One was in Las Vegas which is close to me. Nothing here yet though. Would anybody know if it's possible to obtain the Oreo update using a VPN if I am up in Canada? Good question... Some phones, like the Moto G and E series, have different editions of firmware for different regions and countries. So it would depend on whether that's the case with the Honor 7X. Which version is yours running? Because your phone knows you are supposed to be using a BlackBerry. Funny, I just sold my KEYone and Classic and replaced them with an Essential Phone and a 7x.